Paul Buchheit, the ex-Googler who created Gmail, gave a talk at Startup School. There are a lot of interesting ideas and many of them have something to do with Google. 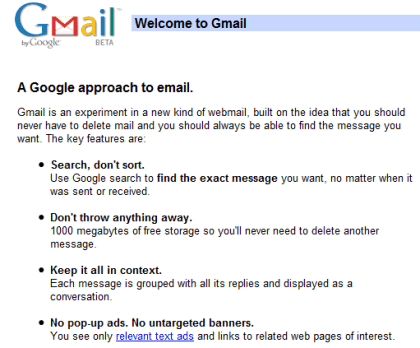 The man who came up with Gmail says that "to be innovative, we need to evade the limitations of established thinking. Creating an innovative new product often means spending years working on something that most people doubt the value of." To be able to do this, you really need to love what you are doing and ignore the voices that tell you that what you are trying to achieve is impossible. As Larry Page says, maintain a healthy disregard for the impossible. Trying to solve interesting problems also helps. "Interestingness is a sign of unexplored or under-explored territory. If I already know what the outcome is going to be, that's not very interesting. (...) But I find that great startups exist in a space of productive uncertainty. Regardless whether they succeed or fail, I'm likely to learn something interesting," says Paul Buchheit. That's one of the reasons why he picked Google back in 1999: he believed that Google couldn't compete with Alta Vista, but at least he'll learn something from the smart people at Google. Google as a startup was different from the way people perceived it. Even if Google was mostly a search engine, Google founders had bigger ambitions. "Larry wanted to store and search the whole web in memory, even though our machines only had 1/4 GB of RAM. It was unrealistic at the time, but Moore's law moves fast and very soon we were doing it, but only because everyone's thinking was already oriented in that direction. He also wanted self-driving cars that would deliver hamburgers. That hasn't happened yet, but I bet it will." For Paul Buchheit, money are only the "fuel" that helps you achieve a mission, not the main goal of a business. "For me, startups are more than just a clever way to make money. They are machines for harnessing the fire of human self-interest, creating a self-sustaining reaction capable of rapidly transforming the world."